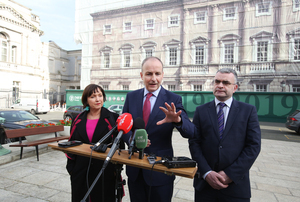 Fianna Fáil Party Leader Micheál Martin (centre) addressing the media with Deputy Leader Dara Calleary TD (right) and TD for Kildare South Fiona O’Loughlin, ahead of the Fianna Fail Ard Fhéis tomorrow. 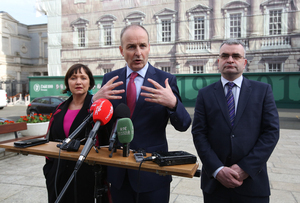 Posted in Misc and tagged Fianna Fail, Micheál Martin at 4:58 pm on February 22, 2019 by Bodger. Will Leo be giving the leaders speech? He reminds me of my boss. Absolutely no idea what to be doing with himself. Ill bet your boss has been more successful in life though ? 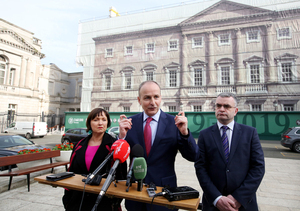 He should give the thumbs up like Enda used to. That was GAS. 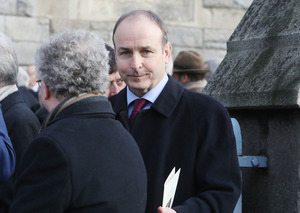 Ah Enda. 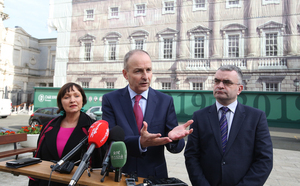 Back in the days when our Taoiseach was merely Father Dougal-esque in his vague incompetence. Instead now we have the optics obsessed, hate the poor, malevolence of Vlad. 1. Was that a question about the Zapper? 2. Please electorate, can I have some more? 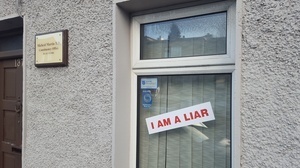 What hot air was he spouting this time, actually, don’t tell me, I’d sooner not know. 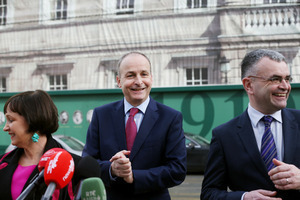 The fake Leinster House in the background is apt though.